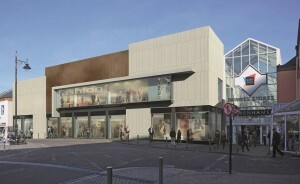 Work commenced at start of the year on the redevelopment of City Square Shopping Centre. 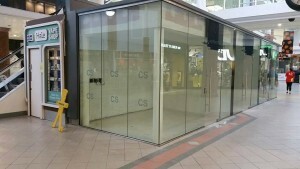 The redevelopment consists of a number of elements; a new unit facing Arundel Square & inside Peter Street Mall, a food court and the expansion of units within the centre. The development on Arundel Square and Peter Street Mall will see an additional 17,000 sq ft of retail space. As everyone knows Waterford is Ireland’s oldest city and with this in mind historical preservation has been paramount. There has been a team of archaeologists on site for several months during which time there have been many interesting finds some of which date back to the 11th century. These discoveries will be preserved for display in the future. The second major change is the construction of a new food court area on the second floor. This will incorporate the old Kylemore unit and adjacent vacant areas. 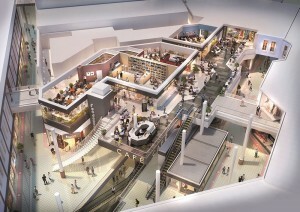 The food court will have four different café/restaurant units and seated areas opened up to the mall below. Freshly Chopped is one of the food offerings and is due to open at the end of November or early December. This will be the first Freshly Chopped store in the south east. New public toilets and baby changing areas will be constructed at the rear of the food court and are due to open later in the year. All stores will continue to trade as usual with late opening on Thursday and Friday and from 12noon on Sunday. Centre Manager Alan Weston said, “Throughout the duration of the works City Square will continue trading as normal looking after our loyal customers. We know that the improvements to the centre will enhance the shopping experience for everyone, young and old alike”. During the construction phase it is expected there will be up to 100 people employed many of whom will come from the local work force. Once the new units are open it is expected an additional 100 people will be employed on a full and part time basis within City Square. Since mid-2016 work has been ongoing in creating larger stores within City Square in response to increased demand from retailers. These larger units appeal to top international and national retailers, one of which included Inglot which opened in October 2016. During 2016, both Specsavers and Gamestop moved into bigger brighter units and by doing so enhanced their product offer. Work will commence shortly to merge the former Edinburgh Woollen Mills and Specsavers stores to create one 3,000sq ft unit with a new stone & glazed shopfront onto High Street. JD Sports have recently commenced their store expansion into the adjoining unit and in doing so, will more than double their floor space. This will allow them to stock a larger product range and more top brands which is what customers desire. The new expanded store is scheduled to open on Saturday 8th April.